Everybody wants bigger arms and we get that. But the thing many dedicated bodybuilders tend to forget is that regardless of how great it feels to have greatly developed biceps, you shouldn’t neglect the rest of the muscles in the arm. In fact, if you want to build truly admirable arms, you need to train every muscle in the arm with the same volume and intensity as you do your biceps. Nobody admires guys with ridiculous muscle imbalances, so it’s crucial to create a balanced approach to training arms that won’t leave any muscle behind. Here are our suggestions. Your upper arm is made up of two major muscle groups: the biceps and the triceps. The core muscle of the biceps muscle group is the biceps brachii muscle, which is composed of a long (outer) head and a short (inner) head that work as a single muscle. The biceps brachii is responsible for flexing the elbow and rotating the forearm and since its fibers are aligned in a fusiform arrangement (which allows for a great degree of shortening), this muscle is capable of producing a wide range of motion. 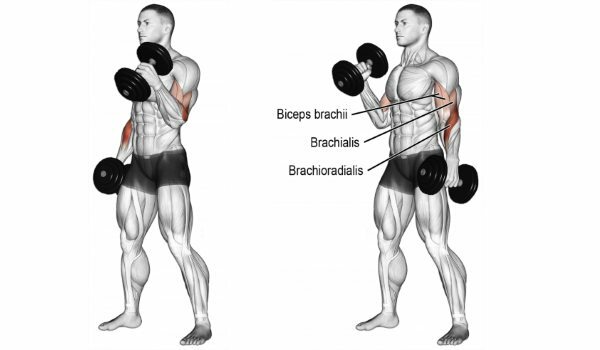 Deep under the biceps brachii lies the brachialis muscle, which is responsible for flexing the elbow, while the brachioradialis muscle which is found in the forearm is heavily involved in rotating the forearm. It’s important to know that the biceps is mainly composed of fast-twitch muscle fibers, which are able to produce quick and powerful contractions. 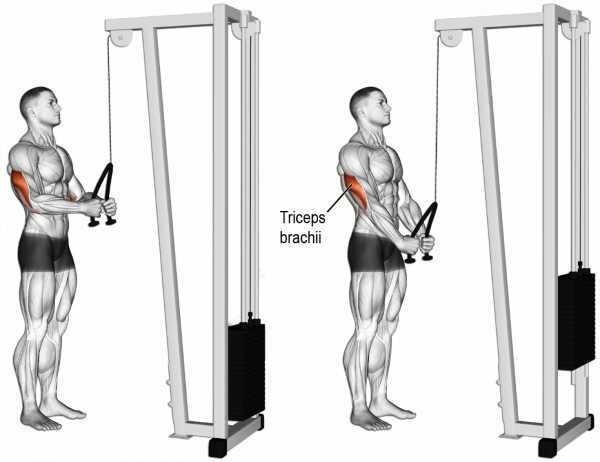 The triceps, as the name implies, contain three heads – the long (upper inside), medial (lower inside) and lateral (outside) head – and it makes up 2/3 of the upper arm. Of the three heads, the long one is the meatiest, but for achieving a well-developed look, it’s important to adequately target and train each head. The medial and lateral heads are comprised of a mix of fast and slow-twitch fibers, while the long head is dominated by fast-twitch fibers. The long head attaches above the shoulder joint, which means that it’s stretched only when your arm is raised overhead. With this in mind, we’ve compiled a list of 6 great arm exercises that you probably aren’t doing often enough. These moves will help you train your arms in ways that your regular routine can’t and powerfully hit the biceps and triceps heads that you might have been neglecting so far. Stand up with feet at shoulder-width apart, holding a dumbbell with both hands with your thumbs around it, palms facing up towards the ceiling. Use both hands to slowly lift the dumbbell over your head until both arms are fully extended. Keeping your upper arms close to your head with elbows tucked in, lower the dumbbell behind your head until your forearms touch your biceps. Make sure that only the forearms move and the upper arms are stationary. 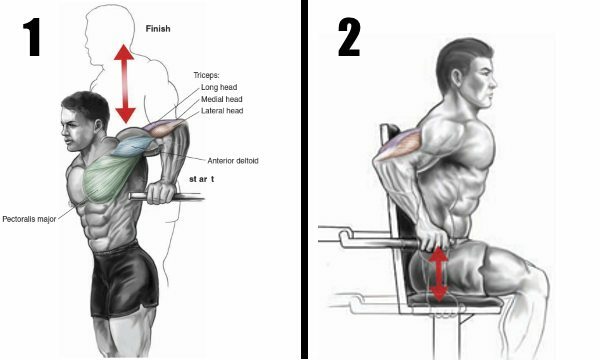 Squeeze the triceps and slowly lift the dumbbell back to the starting position. The reverse cable curl is perhaps the most underused and underrated arm exercise of them all, which is pretty sad because this move could be exactly what you need to push the size and strength of your arms to a truly great level. It mainly works the brachialis muscle, which some people feel is not important as the brachii, and that might be the reason why they will never build huge arms. The other reason why gym-goers bypass this move is because it doesn’t allow you to lift as much weight as you would using a barbell curl with a regular grip. But on the plus side, reverse cable curls promote significant brachialis growth with the use of slow eccentrics (which is what the brachialis respond best to) and by forcing your brachialis to grow, you will actually push your biceps upwards and make them appear larger. Set the cable attachment on a low pulley and hold the bar with an overhand shoulder-width grip with palms facing down. While holding the upper arms stationary and keeping the elbows close to the torso, curl the weights up towards your head while contracting the biceps until they are fully contracted and the bar is at shoulder level. Hold the contraction for two counts while squeezing the biceps, then very slowly bring the bar back to the starting position. This part of the movement should take 3-4 counts. While traditional curls are performed with palms facing forwards, hammer curls are done with the palms facing inwards towards the torso. 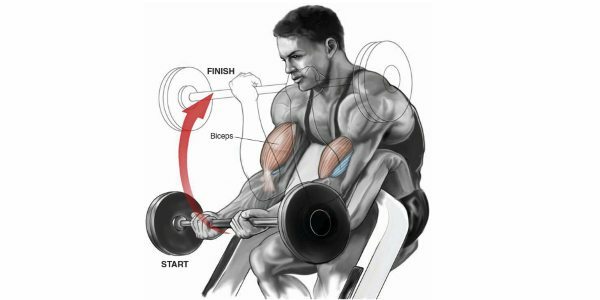 Dumbbell hammer curls primarily target your biceps brachii, involving the brachioradialis as a secondary muscle and also working the brachialis to some extent. Size improvements in the brachioradialis and brachialis muscles will make your biceps appear a lot fuller in size, accentuating their shape even further, so training them is more than worth the trouble. In addition, you can use a lot more weight for this exercise compared to the standard dumbbell curl, so make sure to pick a heavier weight and push yourself as hard as you can. Stand up with an upright torso, holding a dumbbell in each hand at arm’s length with the palms of your hands facing your torso. Hold your upper arms stationary and keep your elbows close to the torso. Only the forearms should move. Curl the weight forward while squeezing the biceps until the dumbbells are at shoulder level. Hold the contraction for a second, then slowly lower the dumbbells back down. Next ArticleTry These Exercises For 5-6 Minutes Per Day In Order To Melt All Your Belly Fat!